The Denver Broncos will face the New England Patriots this weekend which means we once again get to see the two greatest quarterbacks of this generation go head-to-head. If it seems like Manning and Brady have faced each more than you would expect for two players who have not played in the same division since 2001, it is because they have. This weekend’s match-up will be the 16th time Manning and Brady have faced-off in the last 14 seasons, including 12 games in the regular season. But the volume of games may not be for the reason that many people believe. While the NFL would love to manipulate the schedule to make sure Manning and Brady face each other every season, they can’t. The NFL schedule is constructed using a very simple formula and it just so happens that the formula has resulted in so many Manning-Brady games. 4 games are played against each team in one of the other 3 divisions in your conference. Those divisions are rotated each year. This means you play every team in your conference at least once every 3 years in the regular season. 4 games are played against each team in one of the 4 divisions in the other conference. Those divisions are rotated each year. This means you play every team in the other conference once every 4 years in the regular season. 2 games are played against the teams that placed in their division in the same place as you did in your division (e.g. a 1st place team will play 2 other 1st place teams, a 2nd place team will face 2 other 2nd place teams, etc.). These teams come from your conference and come from the 2 divisions not used in the second bullet above. This final bullet is designed to make the schedule a tad harder for better teams. 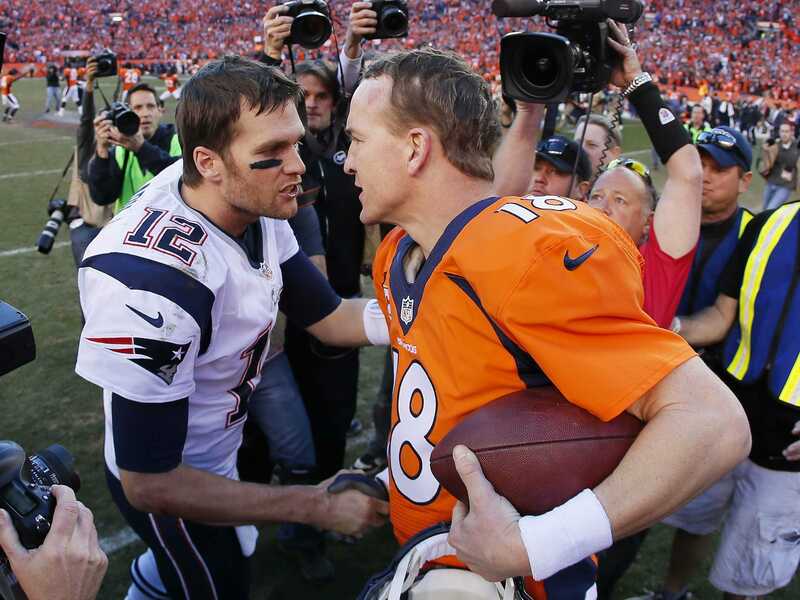 It is also the biggest reason Manning and Brady always seem to face each other. In 2001, Brady’s first season as a starting quarterback, the Colts and Patriots were in the same division and played each other twice. 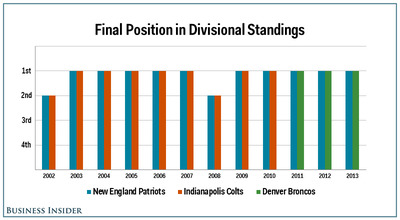 In 2002, the NFL switched to eight divisions, moving the Colts to the AFC South. The two teams did not face each other in 2002. However, both the Colts and Patriots finished second in 2002 meaning in 2003, the first with the new scheduling formula, the two quarterbacks went head-to-head. In fact, since 2002, Manning’s and Brady’s teams have finished in the same place in their respective divisions every year. On the rare occasion when the quarterbacks did not win their division, they just happened to both finish second in the same season. 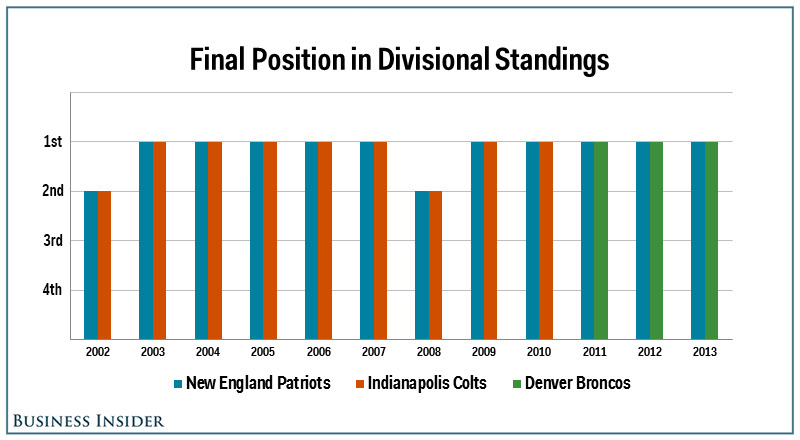 This even includes the 2011 season when both the Broncos and Pats won their division. Manning was still a member of the Colts at the time, but it was the 2011 standings that set up the 2012 schedule. This meant that every year since 2003, Manning and Brady were guaranteed to have a regular season game scheduled whether their divisions were going head-to-head (bullet no. 2 above) or not. The only regular seasons since 2002 in which Manning and Brady did not face each other were 2008 when Brady was hurt and 2011 when Manning missed the season. There is also no sign that it is about to let up. Both the Broncos and Patriots are leading their divisions this season. 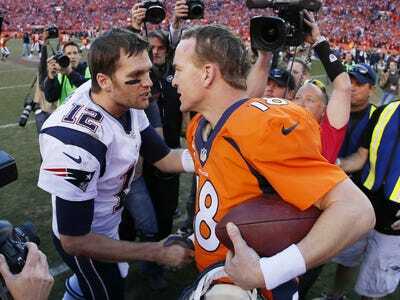 If nothing changes, we will see Manning-Brady 17 (or 18 if the meet in this year’s playoffs) next season.